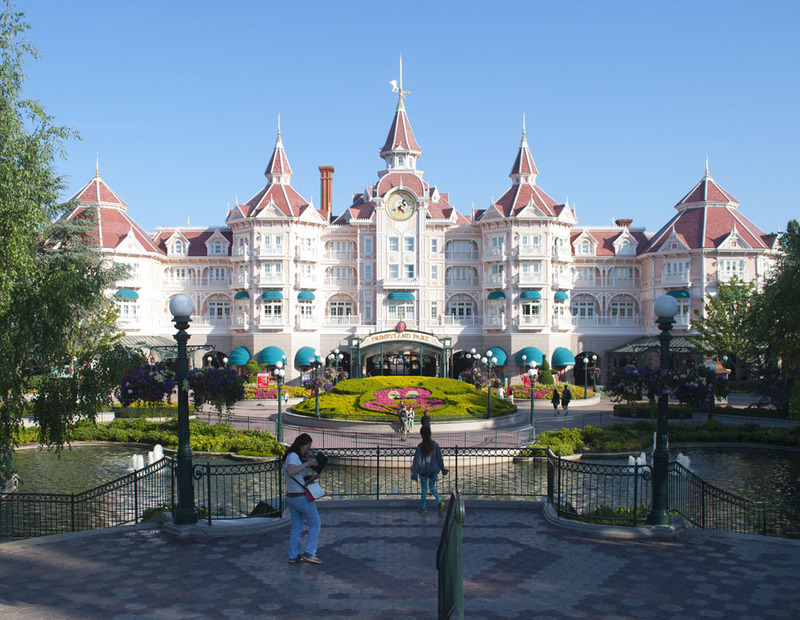 Getting to Disneyland Paris isn’t actually too difficult. Once you arrive in Paris, this basically involves finding your way to the RER-A4 train line. The RER is a regional train system that goes through Paris as well as the surrounding suburbs. A4 is the specific line you’re trying to find. Make sure you get the A4, not the A2 train, as this refers to a specific branch of the A line that will take you to Disneyland. There are many good resources about the specifics of getting around, including the two guides I mentioned previously. Your destination for Disneyland Paris is Marne-la-Vallee/Chessy. 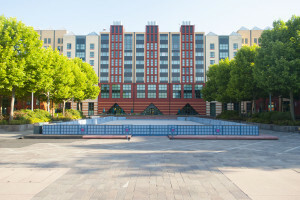 When you arrive at the train station and exit into the plaza, you are actually RIGHT in the heart of the Disneyland Resort. To the north is the Disneyland Hotel and Disneyland itself. To the west is Walt Disney Studios. South leads to the Disney Village Marketplace and the rest of the Disney-owned hotels. Should you be a supremely lucky individual, your hotel is the Disneland Hotel, and you can’t miss it. It is literally the front gate to Disneyland. Just go through Security and towards the front gates. I am confident that even the most directionally-challenged individual will find themselves in the right place. 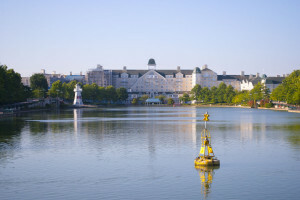 Guests of the New York Hotel, the Newport Bay Club, or the Sequoia Lodge have to go a different way, but it is still within walking distance. If you find yourself on the World’s Longest Moving Sidewalk because you were foolish enough to follow the signs to your hotel, sadly you are headed the wrong way. And you will continue to head the wrong way for quite some time, so get comfortable. After an eternity you will arrive at the parking lot and bus pickup. Turn around, grab a drink from the vending machine if necessary, and start the round trip back to the plaza. Eventually you will arrive back where you started. 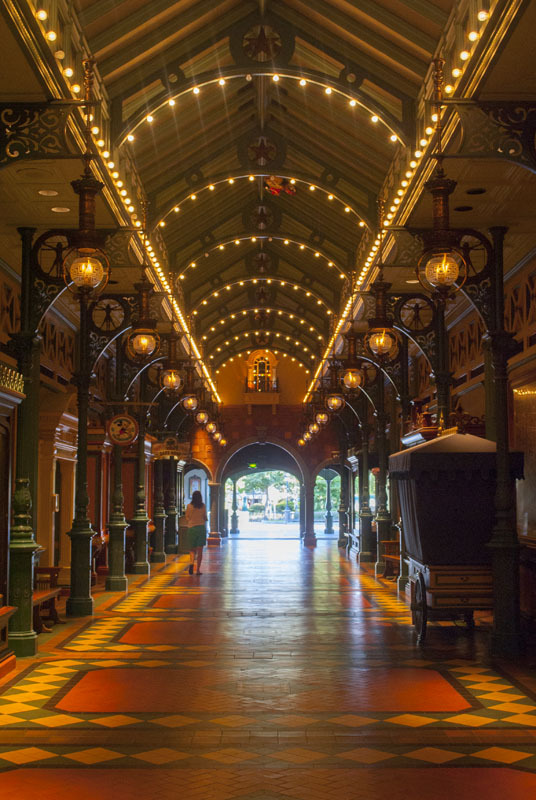 Now this time, IGNORE the signs directing you to your hotel and head through the security checkpoint toward Disney Village. Walk all the way through, and when you come out the back side you will be next to the New York Hotel. Around the small lake found there, the Sequoia Lodge and Newport Bay Club are also visible, but a bit further walk. The Hotel Cheyenne and Hotel Santa Fe are both technically in walking distance, but it is a bit of a hike. The World’s Longest Moving Sidewalk will actually take you in generally the right direction, plus save you some walking at the same time. If you’re staying at the Davy Crockett Ranch, you must catch a shuttle bus because it is actually a fair distance from the main resort. One last thing you will notice as you traverse the security checkpoints is that they are run differently than the parks in the US. In Paris they utilize x-ray bag scanners like at the airport, rather than manual bag searches. The process is actually quicker (in our experience at least) so the line moves at a reasonable pace. 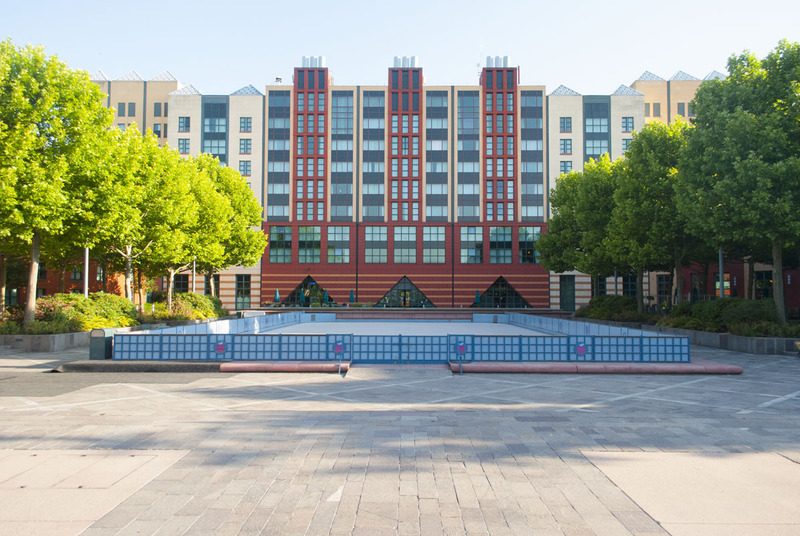 Disneyland, Walt Disney Studios and the Disney Village are all part of one large, continuous security zone so you can walk between any of them without going through security. The hotels, train station, and the rest of the world are not, so plan to go through security if your origin is one of those three places. As you set out your budget, whatever you decide upon, increase it by about 50% to get a more realistic idea of what you will end up spending. Well before your trip, investigate what options you might have through your regular bank for international spending. Some banks, like Bank of America and others, have partner banks in Europe that can significantly reduce your service charges for banking services like ATM’s. No matter what card you plan to use, it’s a good idea to call the customer service number prior to leaving, to let them know your travel plans. When they see Continental charges for $10 ice cream cones start rolling through it should prevent them from putting a hold on your funds. MAKE SURE you look into whatever Foreign Transaction Fees your method of payment will charge. The aforementioned credit cards usually don’t have a fee. Cards like the American Express Platinum don’t either. These fees will usually run anywhere from 2.5-3.0% of your purchase for EVERY purchase for the convenience of converting the currency electronically, so the savings will really add up as you enjoy your $20 quick service cheeseburger. If you don’t have access to a bank chip and PIN or can’t get/don’t want a new credit card, another option is to visit a Travelex currency exchange. There you can preload a chip and PIN cash card in the currency of your choice (well, currently about 5 choices). Sometimes having a built-in limit is good for self-control when you see the perfect $50 T-shirt. If you go this route, just have a backup fund source because there is no such thing as overdraft or extending your credit limit if you empty the card. Did I mention it’s expensive? Hope this is helpful! Next topic will be arrival at the resort and the hotels. Wanting to take a trip to Disneyland Paris? Who wouldn’t? 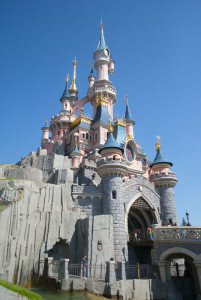 For any fan of the Disney theme parks, going to Disneyland Paris should be a mandatory box on the bucket list. Getting there, however, is not quite as straightforward as a visit to Disneyland or Walt Disney World. Over the next few posts I hope to provide some guidance, especially for some of the more practical tips that I never really found until I experienced it in person. Part of the problem is that specific information is fairly lacking in the United States. A visit to the US version of the Disneyland Paris site will often leave you a bit confused. There is a definite lack of specific reservation and touring advice, which can make it difficult to commit to spending thousands of dollars on your own. For example, for the US parks it is quite easy to pick and choose exactly what you want whether it be hotels, just park tickets, etc. By contrast the Disneyland Paris site links hotel and park tickets. I had originally hoped to buy a 2 day ticket as well as 2 nights hotel since we would be arriving late the first day. But no luck, you have to buy 3 days of park tickets with no option to change it. Think of it as a prix fixe menu rather than a la carte. So for the first time I decided to use a travel agent, just to be sure I didn’t completely mess things up. Major credit goes to Michelle Cunningham at MEI-Mouse Fan Travel for making the process a lot easier. She did a great job investigating different room and price options to find just the right combination for us. If you decide to stay at a non-Disney hotel you probably have more flexibility in regards to tickets, etc but since I didn’t go that route I can’t comment on that. 1. 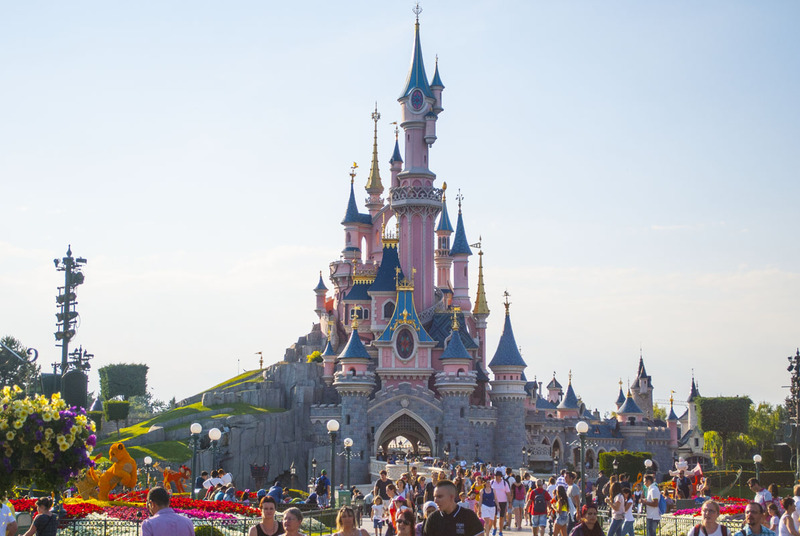 Top Tips for Visiting Disneyland Paris by Kevin Yee. Available as an e-book ($2.99) or paperback at Amazon. This book is relatively short but offers a lot of good, practical advice specific to these parks. Kevin is a regular columnist over at MiceChat and has major Disney credibility. He covers a lot of the preparation for the trip as well as details of the parks and attractions. Highly recommended. 2. 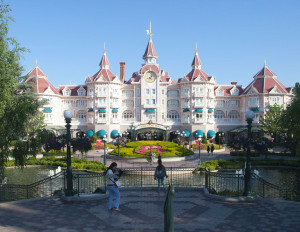 Independent Guide to Disneyland Paris (from a Former Cast Member) by John Coast. Also available as an e-book ($6.99) at Amazon. A much longer text, as well as organized in a fashion similar to typical stateside park guides. This book seems to be updated on a regular basis, and I purchased the 2014 edition. Like Kevin’s book it is details the parks as well as getting to/from them. Particularly useful was the chapter Disneyland Paris for Walt Disney World Regulars, so you know what is similar as well as different. Both books are quite affordable so really there is no reason to not pick them both up. Check to see if your mobile phone is capable of usage in Europe. Some companies offer plans for global travel and will save a lot of money in roaming fees, though calls will still be quite expensive. Data is even better while you’re there if you have the option as free WiFi can be hard to find. Ask your bank/credit card companies if they have a Chip and PIN card available for any of your accounts. Chip and PIN cards are much more widely accepted than traditional magstripe cards and will make your life easier. I will discuss money options in more detail in a separate post. Check the average weather during your visit window. Disneyland Paris can be quite chilly during the winter and even spring months. Even during the summer the evenings can be on the cool side. The next post will discuss some things about money during your trip. Following that will be information about the parks, hotels and getting around. I will wrap everything up with a set of Do’s/Don’ts from personal experience. I recently had the opportunity to visit Disneyland Paris, which is why there haven’t been any map updates recently. Over the next few posts I hope to offer some insights from visiting the parks, because it can be hard to find good information if you’re planning a visit there. In the mean time, I have uploaded a new gallery into the Favorite Photos that is dedicated to that park. I hope you enjoy them! All maps now have their gallery images uploaded, so when you go to the details page it should work. Please let me know if you find any that don’t work, or if they show the incorrect images for the maps. I checked them all (I think!) as I uploaded them but it’s possible I missed some. I’ve been working in the background as time permitted to set up a new way to view the maps. Now, it’s finally live on the site! When you do a map search now, the results page LOOKS the same. But when you click on the map you are taken to a map details page instead. I will be able to have a lot more data displayed about the map including the contributor. You will still be able to download the PDF from that page, just like before. But the biggest change is that now you can look at the map pages directly from the site, and without watermarks no less! I know that the watermarks in the PDF files have bothered some, and I do apologize for that. The watermarks were an unfortunate result of someone taking the files and then selling them. These files are always intended to be freely available to everyone. If you want to see the ultimate results of what I’d like to do, just look at the very first map from Walt Disney World Magic Kingdom, from 1972. Lastly, I am still in the laborious process of converting and uploading the images for each map. If you pick a map that has no pictures yet, it will just be blank on that part of the page. The rest of the details should be there just fine! Have fun, and let me know if you have other requests or suggestions! 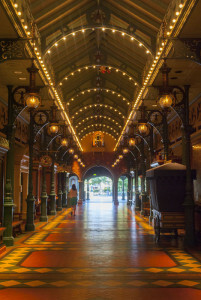 George Taylor over at MiceChat was nice enough to mention this site in his article about the Town Square Cafe. If you’re new to the site, feel free to explore and check out all the Disney park maps in store for you here! Just use the menu bar to pick the location, then theme park. This will take you to a page to pick from the decades of maps available. All maps are available for download in PDF form, just click on the thumbnail to look at the whole thing. There are nearly 450 maps currently available for viewing! Even though I have posted just maps on the site, I do manage to collect lots of other items as well. I’m always looking for any artifacts of park operations, whether it be publicly visible or on the working side. This includes things like the menu George mentioned, but also pamphlets, vacation planners, books, etc. On the operational side, I look for operations manuals, training guides and just about anything else generally not available to the public. If you have something (or even a whole box of somethings) along these lines you’d like to get rid of, please contact me! I’d be happy to work out some kind of deal, and it would be going to a loving home! Drop me a line right here! I’ve been eagerly anticipating more information about this upcoming D23 event, and we finally have more details. The event will run November 22-23 and be held at the Contemporary Resort. As you can imagine, this is like nirvana for a Disney History nerd like myself. At the moment they are promoting appearances by Marty Sklar, Bob Gurr and Alice Davis. They’re also going to be talking about Disney’s participation in the 1964 World’s Fair, appropriate since it is the 50th anniversary this year. There is not a lot of detail regarding the presentations and especially the schedule yet, but I’m going to keep checking back for more developments. I just had to share this great article over on Foxxfur’s site. It’s this kind of searching that I find myself doing on a regular basis as I’m tracing the history of different parts of the Disney Parks. It’s such a well written and researched piece about one of the most loved resorts at Walt Disney World! 7 new Magic Kingdom maps added today, all from the late 90’s. Wow, there were a lot of those! Some of those maps were only good for 4-7 days, since they updated many of the performance times, etc within the map itself, rather than having a separate times schedule. You have to wonder how much money that cost to change the printing so often! I have also been working on some back-end stuff that should make browsing the maps more interesting. When it’s closer to being ready to reveal, I will talk more about the new features!